A while back I wrote how one can sample raster values at point locations in QGIS using the Saga function ‘Add grid values to point’, which is available in the processing toolbox. Recently it was reported here that values uploaded from a floating raster layer are rounded up to an integer. I tried it myself in Saga, and it seems to work fine for me. But if you are running in problems with a function, it is good to remember that in QGIS you have have access to many libraries from multiple software tools. This means there are often more than one way to get things done. With the QGIS GRASS plugin, you can easily open a GRASS raster layer in QGIS. One disadvantage, however, is that if your GRASS layer has category labels, these will not show in the QGIS legend. 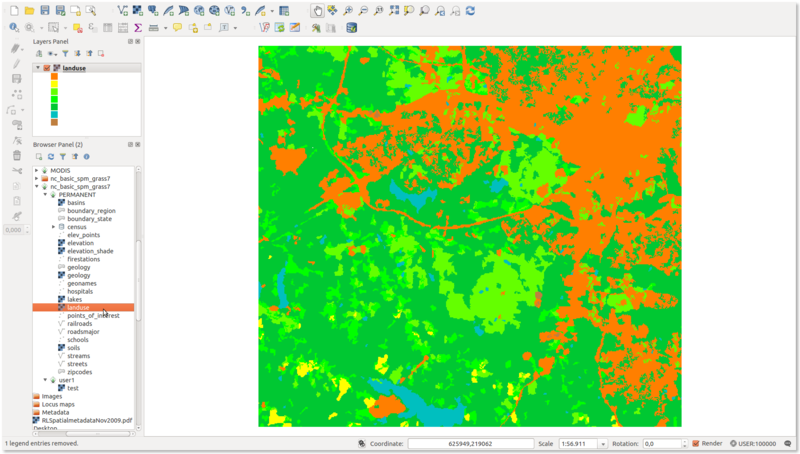 See for example the landuse layer in the North Carolina data set, opened in QGIS in the screenshot below. It isn’t too much problem to define the labels in QGIS if you have few categories only, but what if your map in GRASS has many categories, all neatly labelled in GRASS. Sure you don’t want to add those category labels manually again in QGIS? I don’t, so I wrote a small GRASS GIS addon, r.category.trim, that export the attribute table and colour table in GRASS GIS as a QGIS colour map file. The new QGIS 2.10 (Pisa) has been released, with many great new features, tweaks and enhancements. Check out the changelog for the highlights (you’ll need some time, it is again an impressive list of improvements and new features). The source code and binaries for Windows, Debian and Ubuntu are already available via the large download link on the QGIS home page. More packages will follow as soon as the package maintainers finish their work. A big thanks to the developers, this is again an impressive piece of work!